i tried to think of a food related to 100 for this 100th post. 100 grand cookies. something shaped as 100. 100 calorie servings. i wasn’t feeling it. so i decided a site revamp would be a lot more fun than foods related to 100. well, fun for me to pick out what i wanted, and a lot of work for tom to make it happen. thanks, babe! so, without any more delay, here is the perfect recipe for my 100th post. much like french toast casserole, this is a breakfast dish that you can make the night before. it’s perfect for company and christmas. it travels well and tastes amazing, no matter what you put in it. there are plenty of variations to this recipe. seafood. southwest. vegetarian. ham. bacon. it’s definitely a dish that you can make your own. it’s pictured above with bob evan’s breakfast sausage (thanks publix for stocking this!) and co-jack cheese. spray a 9×13″ pan with pam. arrange bread slices in one layer in the pan. top with 1 lb. of filling. in a medium bowl, whisk together eggs, milk, ground mustard, salt and pepper. pour over top of casserole, distributing evenly. 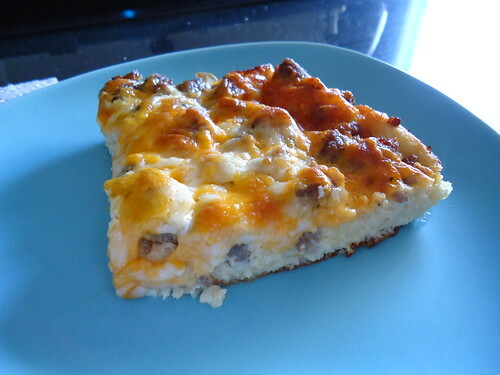 in the morning, remove casserole from the fridge. pre-heat oven to 350°. bake for 45 min or until cheese is brown and bubbly.